Faith and Brie Jenkins are like oil and water. Brie can't remember the last time she and her sister really talked, and she can't understand Faith's unwavering devotion to God and her church. When Faith dies unexpectedly and murmurs of suicide circulate, Brie doesn't know what to do. She's unable to talk to her parents, and her friend and boyfriend don't seem to care. As Brie grapples with her conflicting feelings, she begins to get curious. What was Faith doing the night she died? And why did her youth pastor say that she wasn't as active in the youth group in the past weeks when all she did was attend meetings? These are the questions no one wants to ask, much less answer, and the truth will turn out to be more surprising and dangerous than Brie imagined. Denise Jaden's debut novel is a riveting and emotional story. It deals equally with Brie's grief and the confusion she and her parents experience, and with the mystery of Faith's death and the secret life she led before her death. While Brie is most certainly irrevocably changed by Faith's death and at times overwhelmed by the loss of her sister, this isn't your average grief story. Because Brie never really understood Faith, she doesn't quite act like her parents, and her frustrations and regrets are vented out in her pursuit of the truth. This search leads Brie to befriend Tessa, black-clad and social outcast locker neighbor, who is a lot more than she first seems. They connect over the mutual loss of a sister, their friendship is natural and easy, and Tessa's willingness to bend the rules a bit and her desire for a friend make her a willing accomplice to Brie's digging. What the girls uncover though, is a creepy and dangerous cult that's looking for another member. Because it's a small one, it's believable that Brie and Tess could gain access to it with the help of the founder's brother, Alis (short for Alistair), though the idea that he knows nothing about it is a little far-fetched. It would have been nice to have a little more detail on Faith's involvement with them specifically, but that lack of detail certainly doesn't detract from the story. Jaden striked a good balance between wry humor and grief in Losing Faith, and she displays some nice character development and emotional depth in both Brie and Tess. And with the fast-paced and suspenseful conclusion, Jaden proves herself to be a smart, capable, and strong new author to watch. Cover Comments: I like this cover a lot, though it does cause you to assume it more of a run-of-the-mill grief narrative type of book. Nonetheless, I do I think it suits the book's content well enough. 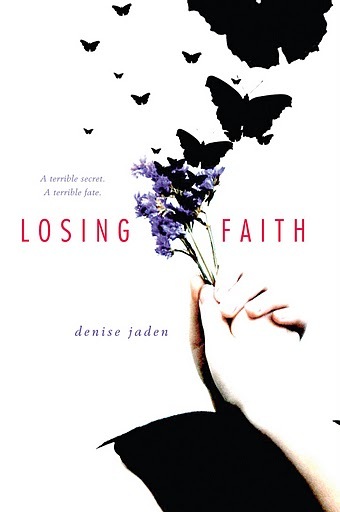 Losing Faith is available now.